Staff Sgt. Balinda O’Neal Dresel | AKANG Mar 9, 2018. JOINT BASE ELMENDORF-RICHARDSON, Alaska — More than 50 Alaska National Guardsmen are supporting the U.S. Navy’s Ice Exercise several hundred miles north of the Alaskan coastline. The training is linked to the Alaska National Guard’s Arctic Eagle 2018, a statewide exercise involving national, state and local agencies designed to provide opportunities for participants to conduct sustained operations in arctic conditions. ICEX 2018, which officially kicked off March 7, is a five-week exercise that allows the U.S. Navy to assess its operational readiness in the Arctic, increase experience in the region, advance understanding of the Arctic environment, and continue to develop relationships with other services, allies and partner organizations. Alaska Army National Guardsmen with 1st Battalion, 207th Aviation Regiment, began preparation for the exercise by outfitting three UH-60 Black Hawk helicopters to carry six and a half hours of fuel in internal and external fuel tanks. The helicopters underwent training flights to test the new weight of the birds. The extra fuel allows the unit to be able to rendezvous at the U.S. Navy’s Ice Camp Skate and get back to their staging location in one trip. Ice Camp Skate is a temporary ice camp that was established on a sheet of ice in the Arctic Ocean, known as an ice floe. The unique opportunity takes the Alaska Guard aviators more than 1,000 miles north of their home location at Bryant Army Airfield and into extreme cold temperatures. The Alaska Air National Guard’s 176th Wing supported preparation for the exercise with an airdrop mission by partnering with U.S. Marine Corps riggers from 1st Air Delivery Platoon, Landing Support Company, Combat Logistics Regiment 17, 1st Marine Logistics Group, to palletize U.S. Navy equipment and conduct airdrop operations via a 249th Airlift Squadron C-17 Globemaster III transport aircraft on to the frozen Beaufort Sea to begin initial set up of Ice Camp Skate on March 2. 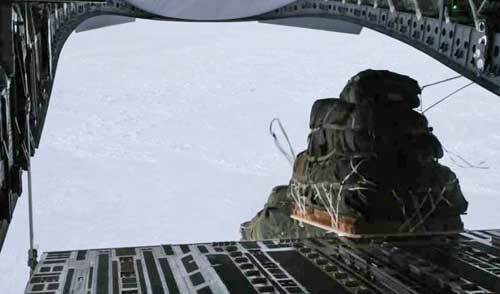 Air Guardsmen from the 176th Wing’s 211th Rescue Squadron crewed an HC-130J Combat King II aircraft and airdropped equipment, including an Arctic Sustainment Package, and 10 pararescue personnel from the 212th RQS into Ice Camp Skate on March 5. The Arctic Sustainment Package is an airdroppable package, including rescue personnel, that can provide shelter, heat, transportation, fuel and food for 28 individuals for up to six and half days in extreme arctic conditions. “This marks a significant point in history since this was the first time dropping the Arctic Sustainment Package out of the HC-130J, Combat King II” said Lt. Col. Eric Budd, commander of the 211th Rescue Squadron and pilot in command of the mission. After highlighting the significance of the drop, Budd revealed that as with the Black Hawk preparation, a lot of hard work went into making the mission happen ahead of time.Within 48 hours of dropping equipment and personnel at the ice camp, the plan was for Guardsmen to transport them back out via the Air Guard’s 210th RQS HH-60 Pave Hawk and Army Guard’s 1-207th AVN UH-60 Black Hawk helicopters. Army Guardsmen with 1st Battalion, 297th Infantry Regiment, would assist with sling load operations, ensuring transportation of all items to Joint Base Elmendorf-Richardson via HC-130 from Deadhorse. Poor weather required a change of plans. The Black Hawks were delayed due to unsafe weather conditions for two days, and due to continued poor conditions, the operation was prevented from mission completion within the scheduled timeframe. “Weather is a factor wherever you fly,” said Cross, “but the challenges we deal with operating in the Arctic during a late winter mission can be a limiting factor that is not overcome until the weather cooperates,” he said. The Pave Hawks at Deadhorse, were not able to sling load all of the equipment out because they were at maximum weight and capacity for cargo and number of roundtrip flights from the ice camp to Deadhorse. “We regularly have to adapt and overcome,” said Budd, adding that a plan was in place to get the additional equipment and personnel out of the ice camp. A number of Department of Defense exercises afford participating forces the opportunity to operate in a joint environment while assessing the ability to conduct sustained operations in arctic conditions including Arctic Eagle 2018, Alaskan Command’s Exercise Arctic Edge, the U.S. Army’s Arctic Pegasus, and the U.S. Navy’s ICEX. The exercises occur in February and March 2018, and dates for each exercise varies.